Last year;s host Dave 'Red' Ferrell flanked by Phillip Shoul and Frankie Hart. 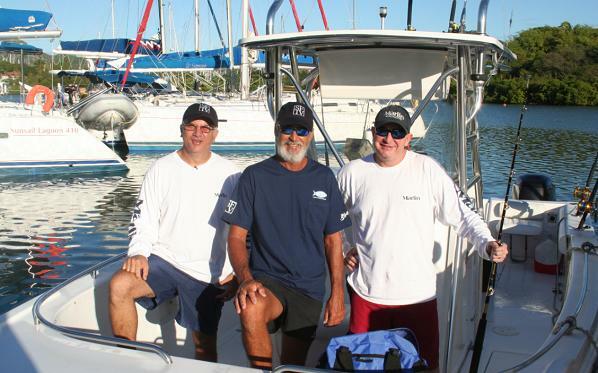 In January 2010, a film crew from Sport Fishing TV visited the island to shoot footage for a half hour television which was aired at the end of March on the Versus Network. The show was part of a thirteen part television series featuring the best fishing destinations worldwide. The crew fell in love with Antigua and return with new presenter Dean Clark to shoot this year's show 'Antigua/Barbuda Shallows' focussing on the wonderful inshore fishing grounds around the coastline. Chairman of the Antigua and Barbuda Sport Fishing Club, Phillip Shoul, who will be hosting the team is excited about their return. 'This TV network have put fishing in Antigua on the map in the USA. They replay the show throughout the year and each time it gives fantastic exposure for our island'. Coupled with the work that Shoul and his team continue doing on promoting the island in the run up to the Annual Sport Fishing Tournament, fishing is set to continue to grow as a tourism sector for Antigua and Barbuda. He also thanks the Antigua and Barbuda Tourism Authority for their help in funding the trip again this year. If you didn't get to see the film last year, check it out here.